The ICPA Planning and Design Hub strives to inspire, challenge and motivate architects, administrators and professionals from across the world to create more humane correctional facilities. The Hub includes projects, resources and discussion threads regarding exemplary practice in correctional planning and design. We believe that this website will be a valuable tool for all of you who are interested in the built environment. Thus far, projects and resources from several countries and various focus areas are posted. Abstract from International Corrections & Prisons Association – ‘ICPA Launches a Planning and Design Hub’ at the following website. Visit the ICPA Planning and Design Hub. 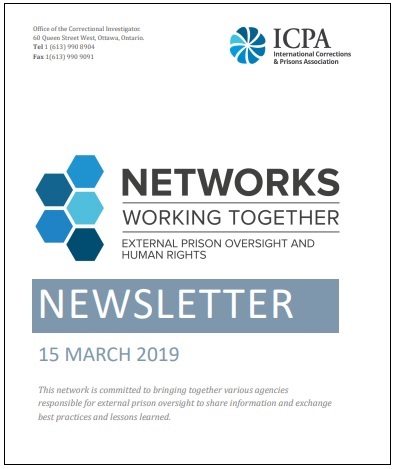 Lean more about the recent launch of the ICPA’s External Prison Oversight and Human Rights Network and read its first newsletter. Read the related ICRC publication, Towards Humane Prisons: A Principled & Participatory Approach To Prisons Planning & Design. A welcome spotlight falls on Canada as the key focus of the very first newsletter of the ICPA’s Network on External Prison Oversight & Human Rights. Published this week to coincide with the launch of the expert network, this new publication examines the question of prison oversight in Canada, drawing on a wealth of practical human rights expertise. As highlighted on this website just a few weeks’ ago, the International Corrections and Prisons Association (ICPA) Network will be launched during the organization’s 2018 Annual Conference in Montreal, Quebec, the week beginning 22 October 2018. From a Canadian perspective, this human rights initiative is especially interesting, as Correctional Investigator Ivan Zinger is the key figure behind the creation of the network. Writing in an opening message to newsletter readers, Ivan Zinger has expressed the hope that the “… network will provide a unique platform to enable organizations involved in prison oversight to share information and exchange best practices and lessons learned.” Comprising at present some 28 expert members from 13 countries across the globe, the Network will in no time grow exponentially and take in many more experts, countries and continents. The Network’s newsletter will initially be published three times a year and is aimed at providing an effective way to share and exchange information and best practices in prison oversight and human rights. With an in-depth focus on Canada, the first issue offers an interesting compendium of articles on prison oversight mechanisms cast across its vast territory, including at the federal-level the Office of the Correctional Investigator, but also analogue mechanisms in Nova Scotia, Ontario, Quebec and Yukon. In addition, Assistant Law Professor at Queen’s University, Lisa Kerr, offers an instructive Op Ed on the function of prison oversight bodies, while Howard Sapers presents a background piece in his capacity as Independent Advisor on the review of Ontario’s prison estate. The origins and objectives of the Canada OPCAT Project are also highlighted in a short article titled Shining a Spotlight on Canada. The newsletter also has some very useful sections focusing on important new publications and relevant academic articles as well as a calendar of criminal justice-related events. The next newsletter is set to focus on both a detention related theme (possibly solitary confinement) and a country jurisdiction. Readers interested in submitting articles or joining the network as experts, should contact Ivan Zinger via his office. In just a few short weeks’ time a new, unique international expert network on prison oversight is set to see the light of day during this year’s ICPA Annual Conference in Montreal, Quebec. The ICPA, as the International Corrections and Prisons Association is known to most readers, will launch its Expert Network on External Prison Oversight & Human Rights during this large-scale gathering of penal and criminal justice practitioners in Montreal the week beginning 22 October 2018. This human rights initiative is especially interesting, as a key Canadian criminal justice actor is behind the enterprise. Federal Correctional Investigator Ivan Zinger is the main initiator of the network which will hold an inaugural panel discussion on Prison Oversight and Human Rights on the morning of 22 October. During this session various guest speakers will address this important topic. From the United Kingdom Her Majesty’s Inspector of Prisoners Peter Clarke will offer his insights into the importance of independent external oversight of closed custodial settings. Moreover, Her Majesty’s Inspectorate of Prisons plays a key role in the operation and coordination of the UK’s multi-body National Preventive Mechanism under the OPCAT and is a highly respected prison oversight entity in its own right. 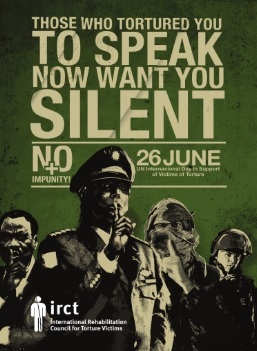 Peter Clarke will be joined in this discussion by Michael Horowitz, the US Inspector General of the US Department of Justice and compatriot, Michele Deitch, a Senior Lecturer at the Lyndon B. Johnson School of Public Affairs at the University of Texas. Michele Deitch boasts an extremely strong academic as well as practical track-record in the domain of prison oversight, particularly in the US state of Texas. The key role played in Canada in this same connection by Ivan Zinger’s institution, the Office of the Correctional Investigator, will be familiar to many readers. This ombudsperson-type institution has also been a vocal Canadian proponent of the country’s ratification of the OPCAT, having urged the Government to do so in past Annual Reports. In addition to the panel discussion, members of the fledgling prison oversight network will meet to discuss its internal organization and future activities. The launch of the Network on External Prison Oversight & Human Rights during this year’s ICPA’s Annual Conference is without question a very welcome initiative and from this promising start bigger and better things are anticipated in the months ahead. Persons interested in its activities, or joining the network as an expert, should contact Ivan Zinger via his office.